FAK Models are obsolete. Availability is limited to factory stock, however modern replacements are also available. Ultra compact designs for domestic (115V a-c) applications: 15, 25 and 50 Watts all under one inch thick. UL recognized, CSA certified, onboard FCC class B EMI filter. Optional metal enclosure. FAK are low-profile single output power supplies packaged in an L-chassis format (open) for domestic North American OEM applications. They operate from 115V a-c mains only or a 110-170V d-c bus. 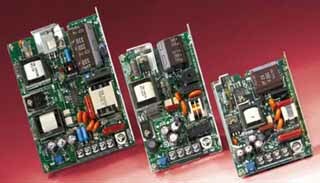 For similar products designed for wide range a-c input, please see the FAW series. FAK can be individually installed as open frame or optionally enclosed power modules. Enclosed power modules can be mounted to a DIN rail They may also be combined into a custom power assembly for multi-output requirements.